In his book Ethics: An Essay on the Understanding of Evil, Alain Badiou offers a critical analysis of that nebulous, and oft abused philosophical subset, ‘ethics’. Badiou proceeds to offer his own constructive concept of an ‘Ethics of Truth’. Both this critical analysis and succeeding construction are, in addition to being a militant challenge to the bourgeois ‘ethics’ of liberal-democratic societies, immanently relevant, critically, to current discussions regarding theological language, method, metaphysics, lack thereof etc. (insert any other vogue approach specific only to theology). I will now (very) briefly exegete a few points Badiou makes in this book before proceeding to the main point of this post; theology’s recourse to its own particularity as the most insidious form of violent oppression. Badiou first offers the reader a critical description of what he labels the ‘ethical ideology’. In short, this ideology is that pious brand of thinking endemic to the western world in which we conceive of humanity as essentially powerless before an evil presupposed a priori to exist. This presupposition of the state of humanity neutralizes all attempts for constructive good, leading us to even denounce all such attempts as evil in themselves. Thus, humanity is forced into a static place of simple subsistence; the status quo of the state is preserved in the never-ending process of defense rather than liberation. Badiou correctly notes, “This is sophistry at its most devastating. For if our only agenda is an ethical engagement against an Evil we recognize a priori, how are we to envisage any transformation of the way things are?” There are other negative consequences associated with this particular ideological instantiation, however, for the purposes of this post we will table those until next week. Simultaneous to this poor state of the human, each person and society has as its ethical directive a responsibility for the care, respect and upholding of the untouchable, impossible to understand and, ironically and most contradictory, self-mimetic ‘other’. Again tabling for now some of the more poignant aspects of Badiou’s analysis here, i.e. highlighting the inherently religious character of conceiving of ‘ethics’ in the principled sense, the important point to note is that this false construction of the ‘other’ leaves all discourse regarding ethics in a stagnant place. Differences are ontologically basic. Sameness is where the real work of truth lies, according to Badiou. Yet, constructive acts of good, defined outside the parameter of maintenance and defense of the current ‘state’, are affectively neutralized now in a two-fold sense of the powerless human faced with the ever present evil and with the ever evasive ‘other’ keeping the person constantly in place. The event is both a situated event, reliant upon the current ‘state’ or status quo context, and a radical breaking with such a situation. The text cited at the top of this post names that particular relationship of the event to the state. The event names that void within the current situation, that visceral lacking thereof that can only be experienced in a revelatory moment to which the subject of truth wills her fidelity after this experience has passed. This brief analysis of how Badiou situates the contemporary situation of the ethical ideology, in addition to his subsequent proposal for its upheaval, is I think important for theological discourse for at least one reason. It adequately describes how much of contemporary theology functions. The current ‘state’ of theology is one premised upon a similar recourse to ‘otherness’. Here this discourse insidiously traps its human agents within a triumphalism of the in-breaking and rupturing act of the supreme ‘other’. This move, I wish to maintain, is similar to the aforementioned concern for the allusive other in the realm of ethics. Concern for humility, acknowledgment of human limitation and fetishizing of difference serve not a liberative function but to bind and control both the human side of discourse and the divine. Radical difference defines the boundaries of discourse. Transgressing this boundary with talk of constructive metaphysics or anything else becomes a violent act. In this sense, the state of theological discourse is once again a violent maintenance of the status quo, deceptively masquerading as true emancipation and dynamic breaking. Theology champions its particularity while those outside the fold struggle for something of concrete emancipatory value. What sort of event might emerge from within this ‘state’? I think that is an important question, especially since the event that may require fidelity in this case is the leaving behind of that particularity and the embrace of something more universally real. Badiou, Alain. 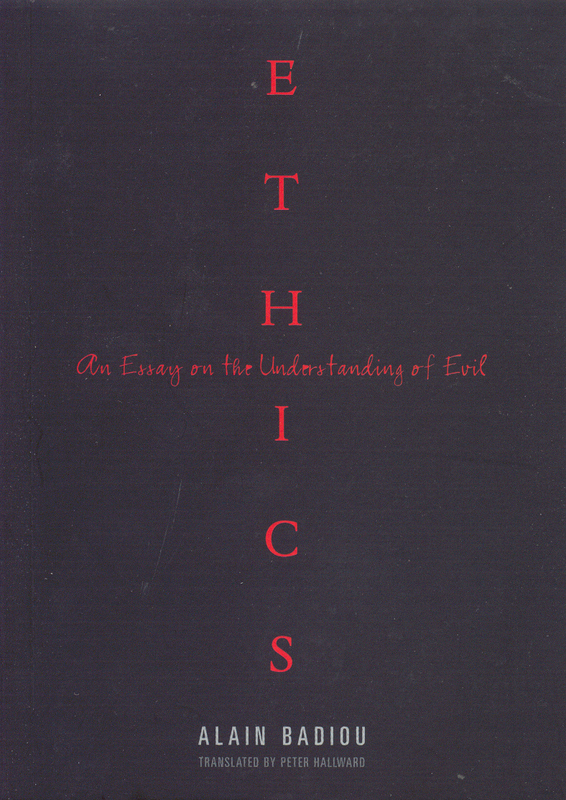 Ethics: An Essay on the Understanding of Evil. London; New York: Verso, 2001. 69. Badiou. Ethics. 13. “if the ethical ‘consensus’ is founded on the recognition of Evil, it follows that every effort to unite people around a positive idea of the Good, let alone to identify Man with projects of this kind, becomes in fact the real source of evil itself. Such is the accusation so often repeated over the last fifteen years: every revolutionary project stigmatized as ‘utopian’ turns, we are told, into totalitarian nightmare. Every will to inscribe an idea of justice of equality turns bad. Every collective will to the Good creates Evil (bold print mine). Badiou. Ethics. 23. Interestingly Badiou actually points to the irreligious appropriation of this ideology of the other, taking off of but somewhat distinct from Levinas’ own concept, as the that which he is attacking in this particular instance. “We are left with a pious discourse without piety, a spiritual supplement for incompetent governments, and a cultural sociology preached, in line with the new-style sermons, in lieu of the late class struggle.” It is not difficult here to see the connection between the aforementioned stagnation of emancipatory theory/action rooted in the weak human/a priori evil and this conception of the ‘other’. This is not however, to say that the religious roots of such a notion of the ‘other’ really give this anymore authorities validity. This is not to say that there are not also issues associated with this approach.